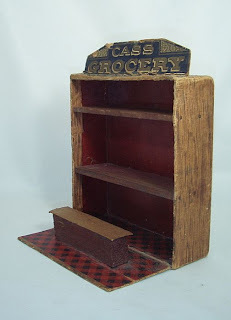 Just found this wonderful piece of miniature furniture made by Cooke's Indestructable Toys way back in the 1890s. It's held up quite well for such a fragile item, so the company was apparently well named! 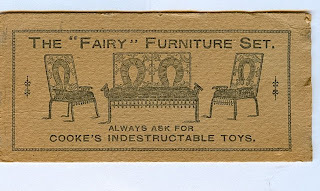 Cooke's called this dollhouse accessory line their "Fairy Furniture," as can be seen in the accompanying original ad. 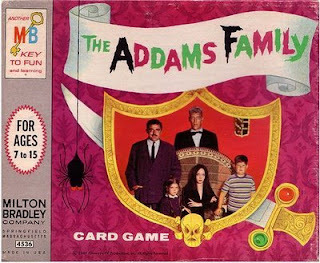 Printed on heavy cardboard, the ad actually forms the base of the sofa, and makes this set readily identifiable. 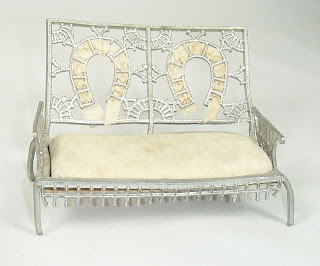 These are two of the most unique items in my antique teddy bear and doll collection. 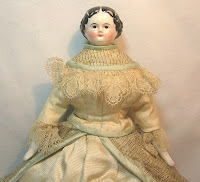 Called Teddy Girls or Teddy Dolls, they were made around 1908, the year that the teddy bear craze swept America. Doll sales temporarily plummeted, causing manufacturers to worry about their Christmas sales figures. Their solution was the creation of this hybrid half teddy bear, half doll. It was not well received: children wanting either teddy bears or dolls rejected it as being neither, and everyone else was just generally creeped out by it. Dismal sales led to a short shelf life, and Teddy Girls are now rather scarce. I was thrilled to find two very different examples. 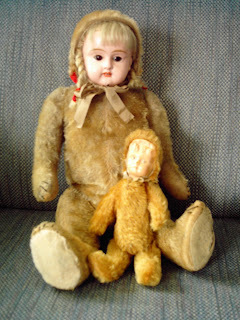 The large doll features a German-made painted metal head with glass sleep eyes, attached to an American-made bear body. 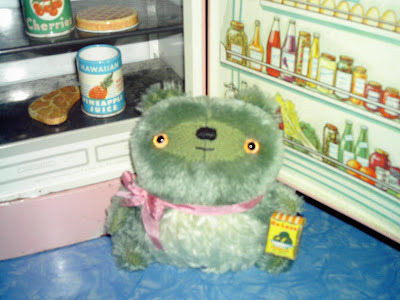 The smaller doll is of a much simpler, more common type, with a celluloid face mask inserted into a teddy bear hood. 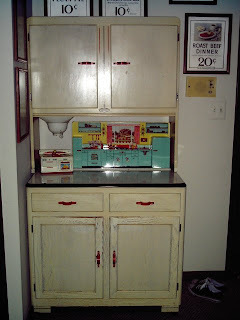 While decorating for my birthday party last weekend, I made this arrangement of vintage toys on an antique cake stand. The big bear wearing the straw hat is a funny English teddy from the 1930s; next to him is an old mechanical bear who "drinks" from his red wooden cup; down in front are a 1920s Steiff duck on wheels and a miniature Steiff lion; to the left is an original set of Bill Ding Clowns; perched just below the mechanical bear is a tin-faced Shuco monkey; and riding the duck is Ting-Ting, a fabulous bear made by teddy artist Peng Peng from Chicago. 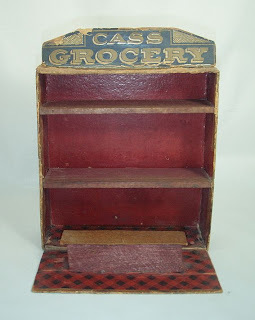 A recent find was this fragile toy grocery, made by the Cass Company in 1914. The little counter in the front folds up into the base for storage. The whole thing is about 9 inches tall. 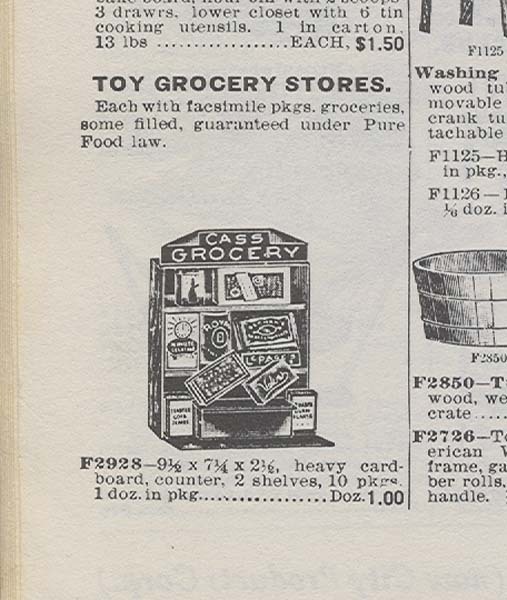 I was also able to find an original ad for this item, which gives precise dating and also shows the products that came with the grocery. It's always an added thrill to find ads like these: they add a lot to a toy collection!